The free-agent NFL safety was told that he needed to commit to not protesting during the anthem. He said no. The news was upsetting, yet neither shocking nor surprising. Free-agent NFL safety Eric Reid had been brought in for a workout with the Cincinnati Bengals and everything was looking solid, until team owner Mike Brown asked him for a commitment that he would no longer take a knee or otherwise protest during the national anthem. Eric Reid, as a San Francisco 49er during the 2016 season, was the first person to kneel alongside team quarterback Colin Kaepernick. He continued this practice, along with 49er teammates, throughout 2017. Reid had already publicly made clear that he was considering ceasing to protest with the new season, looking at other methods to raise awareness about racial inequity, but when Mike Brown wanted an extra assurance, Reid made it clear that his humanity was not for sale. 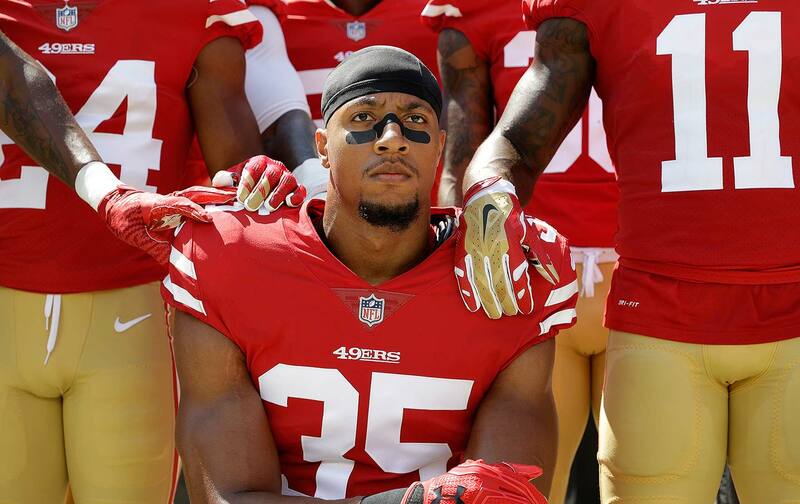 In December, Eric Reid also publicly quit the Players Coalition, the negotiating organization of players who were sitting down with team owners to speak about the protests and attempt to have the owners make financial contributions for various causes related to racial equality and criminal-justice reform. Reid went public to say that he was told by people in the Players Coalition that he needed to stop protesting if monetary contributions were going to made. He called the ownership offer a “charade” as well as “publicity stunt.” He also formally objected to Kaepernick’s being shut out of the negotiations. As with his friend Kaepernick, it is Reid’s lack of willingness to bargain his personhood and principles that is critical to understanding why owners fear what he may do (there is a particular irony in the fear of protest expressed by Mike Brown, given the Bengals’ present and past history of signing players with criminal records as well as histories of violence against women). Reid also expressed that the previous 2016 season had been a whirlwind, saying, “I’ve learned a lot about political athletes in the last year and it has helped me to realize that I’m doing, what Colin is doing, isn’t new. It’s now our turn to step up to the plate. Our goal was to open up the conversation and we accomplished that goal.” Eric Reid is still “opening up the conversation,” and now it is about something far more dangerous to the NFL. It’s a conversation about the league’s moral compass and why it is so terrified of free speech, and about players’ trying to have a conversation about the gap between what this country claims to represent and the realities of daily life for black Americans. The league fears Eric Reid because he is offering only his playing ability to NFL teams: not his politics and not his personhood. His skills are for sale. He is not.